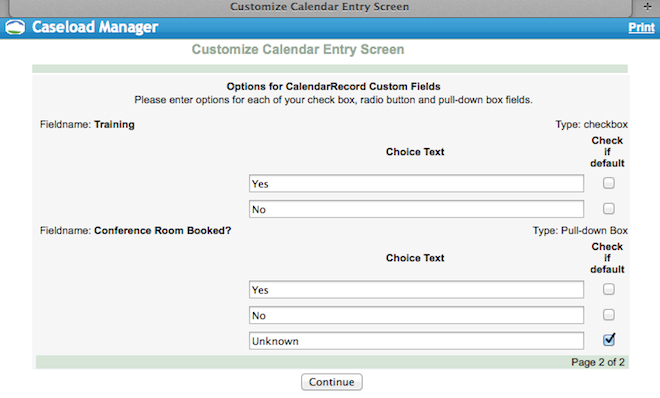 2) A new window will pop open entitled "Customize Calendar Entry Screen." 3) Fill out the relevant fields. Your text prompt is the label of the field--what people will see that prompts them to enter something. The field type can be text (they enter in a small piece of text), Check box (they check if something is true), a Radio Button (a button that people can select), a Pull-down Box (such as the one circled above, will allow users to select from a menu that drops down), and Text Box (allows users to enter in large amounts of text, such as a Notes Field). # Choices: If you selected a field type that allows for more than one choice (such as a Pull-down Box), you will need to indicate how many choices you want. For instance, if your available choices will be 1) Yes or 2) No you will want to indicate two choices. Required: Check this box if you want to require users to fill out this field before they can leave the screen. Text Length: If you chose text as the field type, indicate how much text you would like them to enter. If you would like to limit them to 10 characters for instance, enter 10. 4) Hit Continue at the bottom. 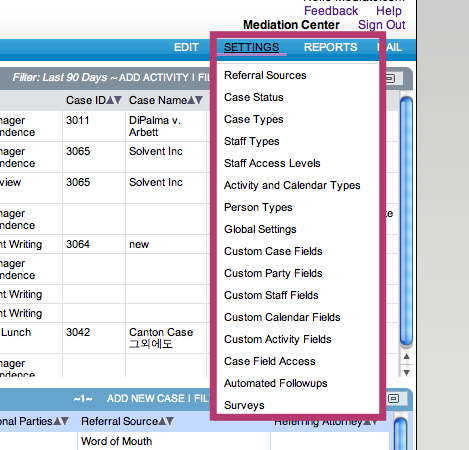 If you selected any field types that have choices, you may enter those choices on this screen. If you would like your choices to be Yes or No, enter Yes on the first line and No on the second line. Hit Continue at the bottom of the screen to save it, and then Close to close the window. 5) To verify your work, in the Calendar Hub, click ADD ITEM. 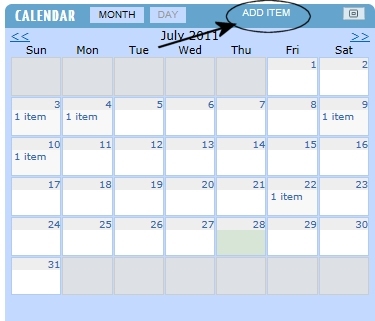 6) When the Add Calendar Item pops open, you can see your new field has appeared at the bottom of the screen.